It’s no secret that the world has changed quite a bit over the past 40 years. When we were young, kids anxiously checked mailboxes for the latest print issue of Cricket. Now they check inboxes for messages from friends. Getting something tangible is still a thrill, but now children access content digitally. They’ve moved from vinyl Colorforms to interactive dress-up dolls and from the magic of Lite-Brite to the beauty of retina displays. Regardless of the medium, there is a common thread between our own childhoods and the activities our children engage in now. That common thread is Story. Stories are the framework for our lives. For more than 40 years, Cricket has been a story innovator, proudly fostering story-making in children, by providing a rich experience of unparalleled narrative, art, and ideas in its award-winning magazines. Cricket is expanding that innovation through our latest partnership with Wonder and Company, through a progressive storytelling adventure, aimed at boldly re-imagining narrative for contemporary young readers. This multi-channel experience will be fueled by user imagination and play out in magical boxes, rich print periodicals, and engaging online experiences. We’re inviting all Cricket families to participate in that innovation. Join us in this Make-Your-Own-Story Adventure, a subscription box and interactive narrative and program for children ages 7-14. The journey begins in January 2016 and will unfold over the course of a year. That same thrill you felt finding your newest edition of Cricket or Ladybug in your mailbox is amplified here, as Wonder and Company’s quarterly Wonderful Objects subscription boxes arrive on your doorstep, full of enchantment and the makings of a story. Those story threads are woven together with content found in our Spider, Cricket and Cicada magazines, revealing, over time, Kyngdom, the world in which this interactive storytelling experience takes place. The plot? Well that’s part of the mystery, and the magic, as it’s shaped by participants along the way. Want your child to be a part of this amazing new adventure in storytelling? 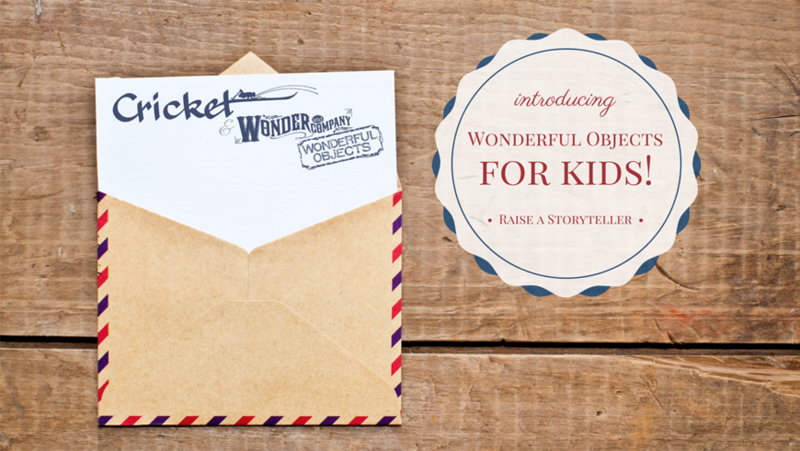 Start by subscribing to Wonderful Objects by visiting https://wonderfulobjects.co/kidsbox and signing up. Then, look for clues in future issues of Cricket, Spider and Cicada magazines. Kyngdom is designed to be a Make-Your-Own-Story Adventure unlike anything your child has experienced before. We can’t wait for the story to get started! Come join us on this magical adventure and receive 10% off any subscription plan! Use code GIFT15 at checkout. Order by December 18 to receive a special under-the-tree gift in time for Christmas.